The air quality management programs that have been successful illustrate a number of common characteristics. 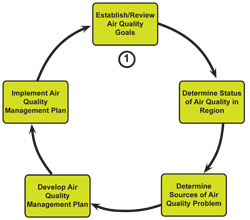 Their air quality management programs tend to follow a five-step program as illustrated in figure 3.2-1. This process can be used for any location and at any scale, from a local issue to a global platform. 4. Develop a science based plan or approach to achieve and maintain air quality goals considering the economic impacts of the control measures. 5. Develop and enforce regulations and initiatives based on their air quality plan. By fairness, it is meant that throughout the program the involved parties feel that they are being treated in an equitable manner. In the case of air monitoring, all sectors of an urban area need to be checked and results openly reported. In the case of emission sources, emission reduction efforts should be fairly balanced among the various source sectors rather than singling out a few symbolic players. Enforcement results should be reported to all parties. This does not mean that all sources receive exactly the same number of inspections or that all parties have to agree with the location of monitors or the adopted regulations, but at least they should feel that they are not being singled out unreasonably or ignored. To ensure the fairness criteria is met, sometimes a working group of stakeholders is developed consisting of all affected parties. This working group follows the process together. Transparency means that all players, the environmental community, the regulated community, and the general public, must at least in a general way, understand the process through which the management programs are conceived and the basis for the air quality plan and subsequent regulations that are developed. That process should be open to review and comment by any interested person. As before, this does not mean that all parties must agree with the results. It is likely that they will not. But they must understand the steps that were taken to arrive at decisions. Finally, it is imperative that the regulatory and enforcement process be applied consistently. One of the greatest problems in failing air pollution programs is enforcement that attacks different emission sectors or even the same sector with different levels of stringency at different times or in different locations. Similar violations should result in similar penalties or at least similar pain to the offending parties. Data on all aspects of the air quality management program should be made accessible to all parties. 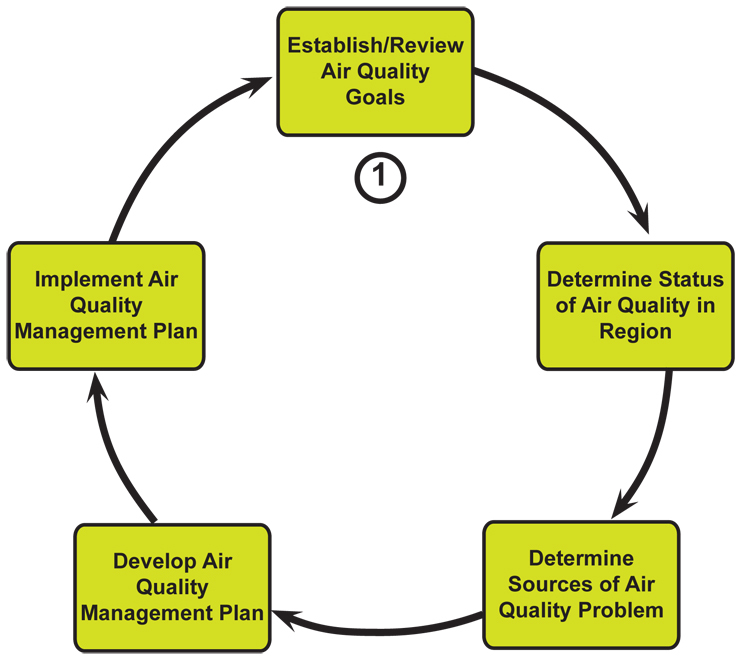 It should be noted that this section refers to a single “air quality management plan.” While independent plans can be developed to address different aspects of a local air pollution problem, it is generally preferable to develop a plan that considers the full range of air pollution problems together. There is often a significant interrelationship between the solutions to different air pollution problems and some control measures become clearly more important when multiple air quality problems are addressed. An example is the ozone and particulate air quality problems in the Los Angeles metropolitan area. When only the ozone air pollution problem is considered, it can be reasonably argued that there is little need to control nitrogen oxides due to the atmospheric chemistry involved in forming ozone. However, nitrogen oxides are an important component of the particulate and visibility problem found in the same metropolitan area. Nitrogen oxides must be controlled to address the particulate problem. Thus, the ozone attainment strategy must be adjusted to reflect the control of nitrogen oxides that are need to address particulate matter and visibility. If these two problems are addressed in the same plan then the necessary adjustments are naturally made. However, totally unworkable plans might develop if the two issues are not considered together. Similar relationships exist with respect to addressing odor and toxic matter problems while addressing ozone or particulate problems. Where it does not make sense or is not possible to mesh air quality plans of multiple pollutants or issues together, then individual plans are acceptable option. Independent air quality management plans are generally better than no air quality management plan at all; and thus, attempts to attain the ideal integrated air quality management plan by delaying important air quality improvement progress should not be allowed to happen. In the case where separate plans must be developed, it may be possible to add checks and balances or some type of overlay to address possible effects on another plan. For example, addition of one step in developing a criteria pollutant plan could be to evaluate each measure on impact of greenhouse gas emissions. If it has a negative effect on the latter emissions category, and alternate method can be found before the plan is adopted. The purpose of this chapter is to take a general look at the various aspects of the air quality management process, how they relate to each other, and their importance in obtaining an effective overall system. Other chapters will discuss specific details related to the various components of the air quality management process.